There has been no shortage of triumphalism from unions and left-wing groups emerging from the recent Supreme Court judgement in UNISON v Lord Chancellor 2017 UKSC in which the fees for entrance to the Employment Tribunal were held to be unlawful. However, in a particularly eloquent and well-written judgement by Lord Reed, his Lordship demonstrates the decision is one which we should all be glad of by taking us back to first-principles. 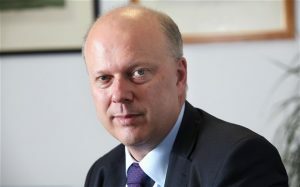 The decision by Chris Grayling (then Lord Chancellor and Justice Secretary) to introduce the fees for entrance-to and a hearing within the Employment Tribunal in 2013, is characteristic of his style as Secretary of State – penny-pinching through micromanagement with little appreciation, regard for or understanding of the bigger picture – an especially poor set of characteristics for the man (at the time) charged with leading the judiciary and management of the court system. The effect of Grayling’s order in 2013 was to introduce an ‘issue fee’, for entrance to the Employment Tribunal, and a ‘hearing fee’ for the subsequent final hearing respectably payable at two-stages. The cost of these fees was determined by whether the dispute at issue feel into categories ‘A’ or ‘B’ – in short ‘B claims’ included unfair dismissal claims, equal pay claims and discrimination, and ‘A claims’ include everything else the Tribunal was able to hear. For an individual application, the full cost of a type-A claim, including both ‘issue’ and ‘hearing’ fees amounted to £390 whereas type-B claims, however, amounted to £1,200. The rational behind the introduction of the fees was to make the Employment Tribunal self-financing, whilst encouraging would-be applicants to reconcile with their employers through arbitration and conciliation services, to deter unmeritorious claims and, for those that do apply to the Tribunal, to settle before a final hearing. During the height of austerity and it being a facility that few require direct access, the temptation to ‘trim’ the department’s expenditure here was evidently irresistible to Mr. Grayling. However, this perception of the Tribunal being a ‘facility’, like any other public service, has now proven to be this policy’s undoing. A phrase commonly used, but perhaps more commonly misunderstood, by politicians is ‘the rule of law’. In their recent judgement, the Supreme Court accepted the Lord Chancellor had powers by Act of Parliament to introduce fees to access the tribunal, but on the proviso that these fees were proportionate in balancing the constitutional right under UK law, that individuals may access the courts, against any fiscal objectives the government may have. Indeed, the former naturally must take precedence – it is uncontroversial that fiscal targets must give way to constitutional fundamentals that have existed for centuries. Even if a statue does allow for a minister to impede access to the courts, it is interpreted as authorising only such a degree of intrusion as is reasonably necessary to fulfil the objective. Lord Reed provides an excellent brief history of the evolution of the system of common-law in England and Wales, and illustrates its roots in the ability of individual litigants to bring action so that courts and tribunals may determine and apply the law. Moreover, in instances where particularly important or complex questions of law arise, it is imperative that these points are given opportunity to be heard in the appellate courts, so that the answer may imbed itself in the law of the land and see its uniform application across the country so as to give certainty to employers and employees alike. His Lordships’s fundamental point being that WE ALL have an interest in the law being correctly applied, irrespective of whether we are ourselves are litigants brining action in a court of tribunal. The approach taken by Mr. Grayling flew in the face of this principle and their Lordships were quick to pounce on the arbitrary level of the fees levied against applicants. So as to not impede the right of access to the Tribunal, the fees charged must be calculated in such as way so as to make access affordable to everyone. The right of access to the Tribunal is a right, enshrined in law, that all those in employment should be able to rely upon, irrespective of income, so that rights to which individuals are entitled are effective. For a government to deny access is to render these rights meaningless. Additionally, to those who can afford the charges, the effect of those charges is, in many cases, to make action in the Tribunal pointless – for those on low-incomes, the £1,200 cost of a type-B claim, coupled with the stress of the litigation process and no guarantee of success, makes for an unattractive prospect. However, there is a more fundamental issue here – if the effect of the fees is to deter potential applicants to such an extent so as to deter as many meritorious applications as those that are unmeritorious, their effect is to impede the evolution of the common-law. These would-be applicants who may have valid disputes, many of which may raise important points of law, are being denied the opportunity to be heard by, not only the Tribunal, but also the Employment Appeal Tribunal, the Court of Appeal, and potentially the Supreme Court. As such, the fabric of the law that determines our life as a nation, is being deprived the evolution and development that is necessary to keep it in step with the times. This evolution is particularly important considering the rise of the ‘gig-economy’ and the potential for fundamental shifts in workers rights as the Brexit process gets underway. As such, it is imperative that access to the courts so as to ensure the ongoing development of the common-law. This writer has suggested elsewhere that the Courts, unlike many public provisions, are an area that con only legitimately be administered by the state. Indeed, they will be an especially essential pillar as the UK goes through a period of great change and it is right that they are adequately funded and parties have unhindered access to them. 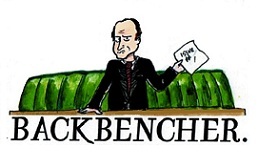 This writer is no left-winger, by any means, but I also have little enthusiasm for Chris Grayling’s approach to government. The judgement by the Supreme Court, by having to give a 101-class in the ‘rule of law’ to Grayling, is illustrative of his failure to grasp the basics of the legal system under which we live. Moreover, because this barrier to the evolution of national life has now been lifted, whatever our individual incomes, we can rest more easily in the knowledge that we all may access the Employment Tribunal so that the law may be given effect to. 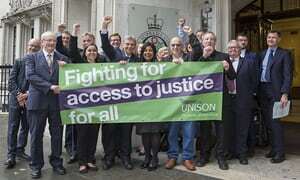 Not only is this a victory for UNISON, this judgment is a victory for every employed-person in the country.